When pro-football player and convicted murderer Aaron Hernandez died by suicide last year, rumors about his bisexuality were already being discussed in the media. Now his lawyer says that he came out just before his death. In 2013, the tight end for the Patriots was arrested in connection with the murder of Odin Lloyd, his fiancee’s sister’s boyfriend. He was convicted in 2015 and sentenced to life in prison. According to a Newsweek report from last year, Lloyd called Hernandez what he interpreted to be an anti-gay slur, and Hernandez feared Lloyd would out him as bisexual. Several days later, he was found dead in his prison cell. His death was ruled a suicide. 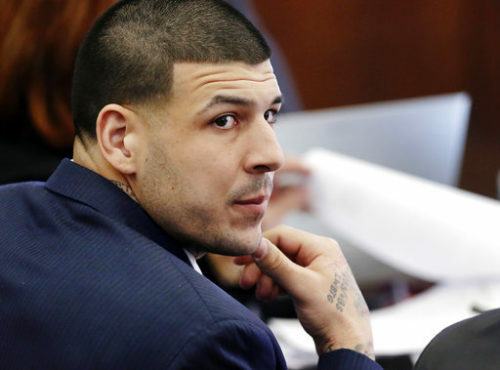 Hernandez’s lawyer Jose Baez has a new book this week, Unnecessary Roughness, in which he says that Hernandez opened up about his affair with a man just days before he killed himself. Baez said that he was discussing the prosecution’s strategy to turn his fiancee Shayanna Jenkins against him by questioning her about his affairs with a man and with a woman on the witness stand, when Hernandez broke down crying out of fear that Jenkins would find out about his relationship with a man. Baez said that Hernandez seemed “hopeful” after their conversation, and the next day he sought out Jenkins to tell her about the affairs so that she wouldn’t be blind-sided. “While the news about the woman did not shake her, I could see the betrayal in her face when I mentioned the man,” wrote Baez. Baez did not give the man’s name, writing that he does not want to out someone who is presumably still alive. In an interview for the documentary Aaron Hernandez Uncovered, George Leontire, another of Hernandez’s lawyers, said that he knew his client was gay. Alyssa Anderson, his college girlfriend, also said in the documentary that she thought Hernandez was bi or gay when she caught him texting other men.